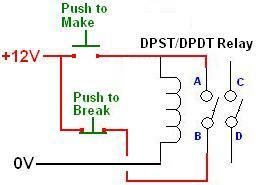 A latching relay is a relay which only draws power during the brief voltage pulse required to make it change state. These are very useful in situations where energy efficiency is important, but also in sitations where you need the relay to remember its state – typically so that the user can press a button to close the relay, and press a second button to open the relay again. The relay remembers which button was pressed last. Latching relays can be expensive, particularly when they are required to switch high currents – therefore where energy efficiency is not vital, but relay latching is required, it is possible to use the circuit design which follows to create a latching relay using a bog standard DPST or DPDT relay. 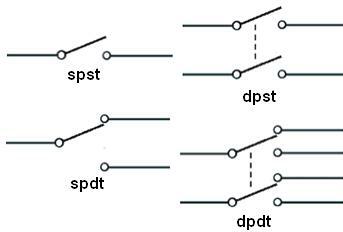 DPST (double pole single throw) and DPDT (double pole double throw) relays are relays which have twoswitches – i.e. they can control two different things at the same time. The diagram above shows how such a relay can be used to make a latching relay circuit. The circuit has two buttons – one is a push to make which closes when pressed but is otherwise open, and the other is a push to break which opens when pressed but is otherwise closed. When the push to make button is pressed, 12V goes across the coil energising the relay. This closes the two internal relay switches connecting A to B, and C to D. With A connected to B, the positive from the 12V power source feeds through A and B to arrive at the relay coil keeping it energised even when the push to make button is released. Therefore the relay has been latched. In order to de-energise the relay, the push to break button needs to be pressed which cuts the positive connection feeding through A and B and energising the coil. With that button pressed, there is no voltage across the relay coil and so it de-energises. While the relay is latched, C and D are connected and therefore can be used to switch on whatever device or appliance is to be controlled by this latching relay system. Push to make and push to break buttons are available cheaply here: push buttons in a range of colours as shown above to give clear visual differentiation between the latch on and latch off button. 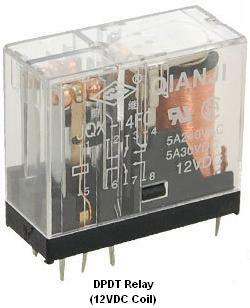 Similarly many different specifications of DPST and DPDT relays are available here: DPST and DPDT relays.